It was an amazing event: A group of armed student activists stormed the Burmese embassy in Bangkok on the first of October, turning their backs on eleven years of passive resistance and non-violent struggle. Aung Zaw, who at the scene to cover the hostage drama, examines the reasons behind this apparent about-face. Kyaw Ni decided to join his friends after learning of their planned protest. “It was a purely non-violentgathering,” said a group leader years later. The next day, 38 Burmese activists including Kyaw Ni went to the Immigration Detention Center (IDC) in Bangkok, where they staged an hour-long silent sit-in protest. Their objective was to ask the Thai government to allow Burmese activists to stay in the country. This was in 1991. The 38 Burmese students who quietly sat down to express their demands in a peaceful way made an impressive sight. The activists, all dressed in white shirts and black trousers, looked pleasant and polite. It was a true Gandhi-style peaceful gathering. But the hour-long sit-in protest did not achieve anything. 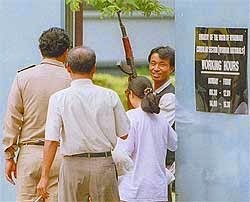 The protestors were simply rounded up and taken into the Special Detention Center (SDC) where two former hijackers, Ye Yint and Ye Thiha, were also being detained. Kyaw Ni and his friends were held for almost 8 month at the SDC, where they met the two hijackers. “He was a quiet kid who didn’t talk much,” recalled a former friend of Kyaw Ni. On October 1, the sound of gunfire could be heard coming from the Burmese embassy in Bangkok. The news spread quickly that five Burmese activists had stormed the embassy compound and were holding 38 people hostage. A hostage-taker appeared at the embassy gate holding an AK47 in one hand and a hand grenade in the other. Friends immediately recognized him. It was Kyaw Ni, or “Johnny,” as the media called him. Gandhi is no longer Kyaw Ni’s ideal. The embassy siege was carried out desperado style, with five Burmese activists storming into the embassy compound with guitar cases containing guns. The moment they were inside, the guns came out. Their mission had started. The fighting peacock flag, the emblem of the Burmese pro-democracy struggle, was raised on the embassy flagpole, replacing the official Union of Myanmar flag. Thirty-eight people, including embassy officials and foreigners, were held hostage while a further 51 people hid inside the compound. Ambassador U Hla Maung, a staunch supporter of the junta and a close associate of powerful Burmese leader Lt-Gen Khin Nyunt and other high-ranking officials, narrowly escaped the siege. The embassy drama might have ended very differently if the five radical activists had been able to apprehend the ambassador, who had left the embassy just five minutes earlier. A few hours later, faxes were sent to media organizations. The “Vigorous Burmese Student Warriors,” as the hostage-takers called themselves, were a new group on the Burmese dissident scene. But their three demands were not new. They called on the military regime in Rangoon to release all political prisoners, start a political dialogue with the main democratic opposition party, the National League for Democracy, and convene parliament, which had not been called since the NLD won a landslide victory in free elections held in 1990. By late afternoon, however, Johnny and his group had changed their demands to just one: a helicopter to take them back to the Thai-Burma border. Puzzled Thai officials said that throughout their negotiations with Johnny, he rarely mentioned the original demands but kept asking for a helicopter.